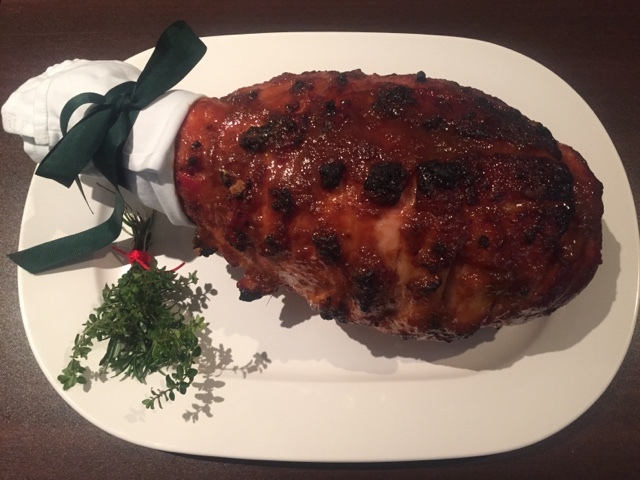 Having always wanted to try to make glazed ham for Christmas, it was finally my chance. I had visions of marmalade, whisky and mustard flavours studded with cloves. Researching recipes that had instructions to soak the ham with water, or add cider or guiness in the basting mix, wasn't really what I had in mind. 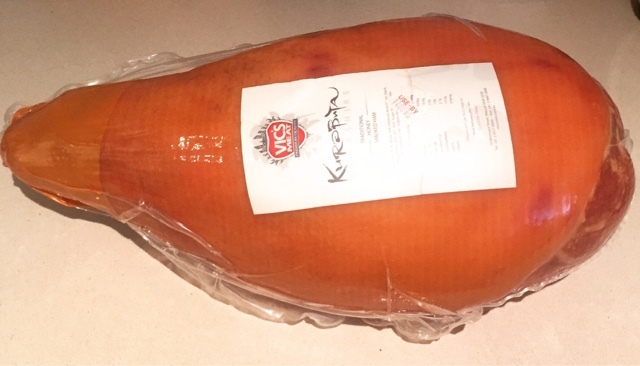 Pre-ordering my 6kg Kurabuta honey smoked leg ham from the local butcher meant that I didn't have to pick it up til the day before. As I recently re-sorted my spice stocks, I knew what I had in the pantry. My glaze was going to consist of a jar of my homemade mandarin marmalade, a good dose of brown sugar for caramelisation dosed with ginger and mustard. Fingers crossed, I hoped that the glaze would work out. The baking smells of ham, marmalade and cloves are irresistible. 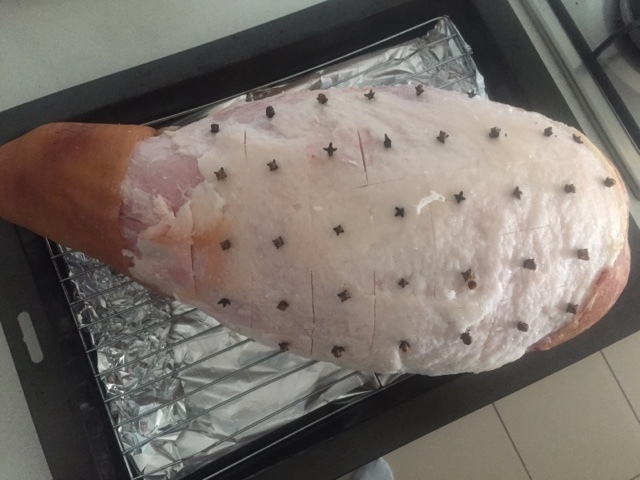 Watching the fat rendering, separating into the diamond shapes highlighting the clove centres, this was going to be one good looking ham. 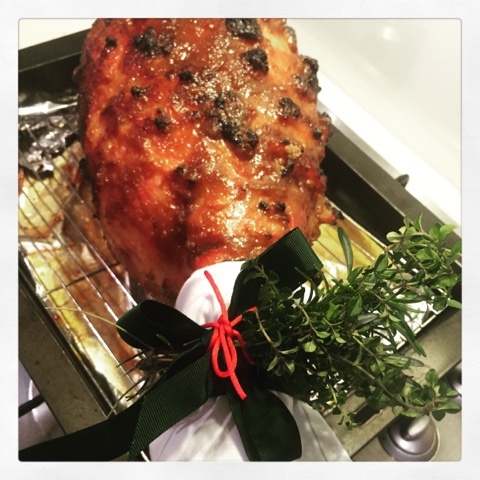 With time up my sleeve, I covered the bone part of my ham with a white napkin wrapped in a green ribbon and a bouquet garni of freshly picked rosemary and thyme to finish the dish. Not only did it look good but it tasted amazing. Can't wait to have another go at this at the end of the year. 1. Use a small sharp knife to cut around the rind, about 5cm from the end where the bone is. 2. Run a knife under the rind, around the edge of the ham. 3. Gently lift rind off in one piece by running your fingers between the rind and the fat. 4. Score the fat, (in our case there wasn't that much fat, so it was a 0.5cm deep), in a diamond pattern, taking care not to cut into the meat. 6. Preheat oven to 200°C (400°F). 7. Place the marmalade, mustard, sugar, ginger in a bowl and whisk to combine. 8. 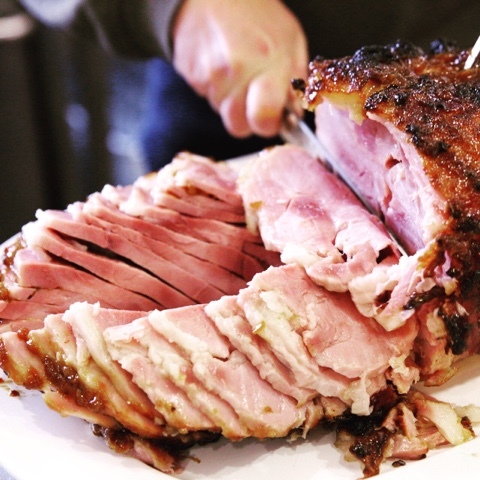 Baste the ham every 10 minutes for 35-40mins or until the ham is golden and caramelised. Freeze left over ham and ham bone for soups. Label, date and freeze for up to one month. When ready to use thaw in fridge overnight. Leftover ham is fantastic for breakfast or supper. 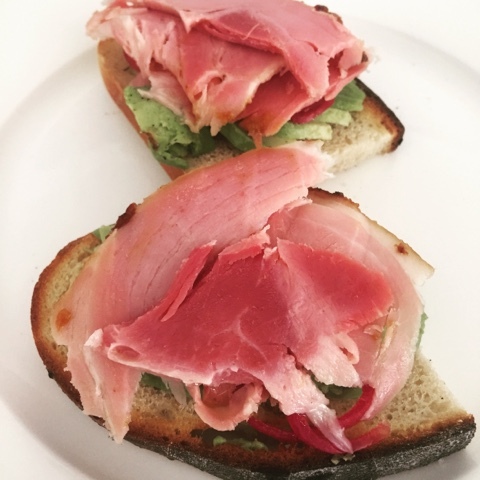 My sourdough bread was perfect for the job with pickled onions, avocado.